Today, the hardwood floors are popular, in fact, they are really beautiful and has a distinctive style. Overall the atmosphere and the interior design of your home changed dramatically to be more classy and boost the design of the floor of the house, of course, by installing hardwood floors. When the hardwood flooring in your home clean and shiny, it can give all occupants to be comfortable. In addition, by maintaining the quality of hardwood flooring to always be beautiful, it can set a welcoming tone and impressive to your guests and invite them to always come back. So, how to keep your hardwood floors always amazing for several years? Here are some tips that you can do to keep the hardwood floors remain durable, beautiful, clean, and beautiful. 1. Always Sweep Your Hardwood Floor. Make a habit to sweeping the hardwood floors every day so that dust does not accumulate and stick on it. Use a fluffy broom or vacuum cleaner to clean, then proceed with a dry cloth to remove the remnants of the dust. Considering the main ingredient hardwood floors is made of wood, the main enemy is humidity. Therefore, it is recommended care for hardwood floors with a vacuum cleaner or broom only. Never mop the hardwood floor because the rest of the puddle trapped in layers of plywood can make the wood rotted. Moreover, with increasing humidity on a hardwood floor can cause a drastic difference in pressure, so that the joint (connection between the hardwood floor) can escape when the floor tread or will rustle and crackling. 3. Avoid Using the Water. Although many products that promise hardwood flooring is scratch resistant and waterproof, it is better to avoid the use of water on hardwood floors to make it more durable. Do not let water seep into the pores of your hardwood because it will make peeling. If you find signs water in the pores of the hardwood floor, you will need to remove the protective layer of wax. So, make sure the floor is completely dry thoroughly to avoid water seeping into the deeper layers, which could eventually cause the floor to become dull and damaged. 4. 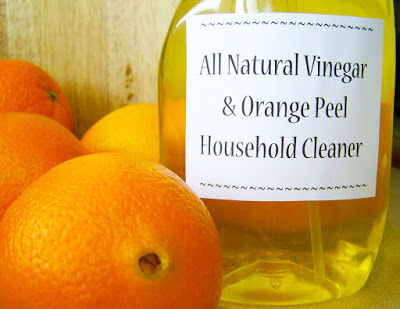 Immediately Clean the Stains on Hardwood Floors. If the hardwood floors soiled with of food or drink, immediately remove the stain with tissue or a dry cloth. Then use special cleaning fluid to clean hardwood. There are several special chemical cleaning agents that cure stains caused by alcohol, food, inks, oils and even urine. Avoid using harsh cleaners such as Pine Sol or bleach on a hardwood floor. The use of harsh cleaners can damage your hardwood floors and make them look dull and worn. 5. Be Careful to Scratches. In order not to cause scratches on hardwood floors, you have to be careful when moving goods. 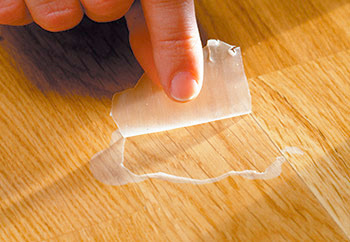 Preferably goods lifted and use furniture pads are coated with rubber so it not to cause scratches on the floor. Furniture pads placed in the bottom corner of the furniture, or the legs of furniture – sofas, chairs, cabinets, desks, dressers, and beds. 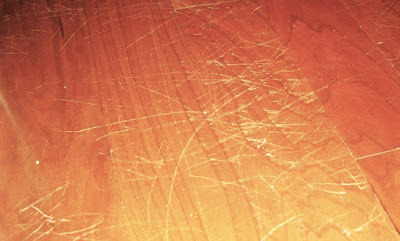 It is useful to avoid scratches that occur when furniture shifts that may scratches can be permanent and irreparable. Footwear or shoes should also not sharp or hard. 6. Perform the Special Care. For hardwood floors made of solid wood, there is additional treatment that must be done. Every month the floor should be polished using the polishing liquid wood (ex: teak oil, pledge) and every two years must be re-coating. Make sure that you use the proper varnish materials because there are some varnish wood floors inadequate for hardwood floor and will actually damage the floor. 7. Remove Stubborn Stains on Hardwood Floor. To clean stubborn stains and make the hardwood floors more shiny and clean, you can take advantage of the water used lemon juice or starfruit. You can also use white vinegar that allowed to stand for 4 minutes at a stain on the hardwood floor, then wipe with a clean cloth. Besides keeping the humidity, a good company where you purchased the hardwood floors also inject termite on the hardwood. 10. Additional Treatments for Hardwood Floor. For the tropics, hardwood floors requires extra care because the wood color can fade due to sunlight. To keep the appearance of hardwood floor, you should often interchange the furniture in the room that using hardwood. And usually, the company complements the hardwood floor with steam service once every 6 months. This serves to maintain the color and cleanliness hardwood. Follow the tips above to keep your hardwood floors is absolutely beautiful. The key to maintaining the quality of your hardwood floor is always clean and maintain moisture. Make sure all sand, dirt, and dust is clear on your hardwood floor. Plus, every few years, hardwood flooring should get a good sanding and refinish is done by a professional. 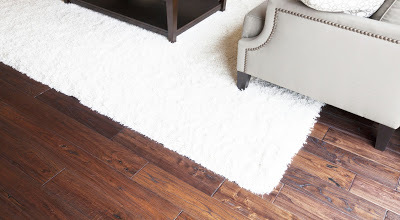 By doing this, you will keep the beauty of your hardwood floors and you’ll protect them!